Glass can be used for just any application or need and without any limitations. Having said that, you can also enjoy the comfort of choosing your favourite colour to complement your overall interior design. And 3rd but not last, glass will always keep its value, look fashionable and beat timely trends, or at least – stay with them, and you. Adding glass to your kitchen, bathroom, laundry, walk-in pantry, bar or anywhere else, you can’t go wrong, except, you don’t. 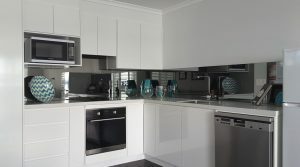 Just as with our other, German high quality material splashback solutions; Metaline, or “Acrylic”, Glass is another smart choice over tiles, and – glass adds an incredible portion of style to your kitchen, bathroom, shower, etc., which any visitor to your home or office will envy you for. The only limitation a quality OzzieSplash glass splashback will need to bare is, your level of imagination. Lucky we’ve got some answers for you. Simply click on the butterfly and let OzzieSplash fly you to your answers.